Thanks for checking out our new episode! Today’s episode looks at Marvel Tales Flip Magazine 7, from March 2006. 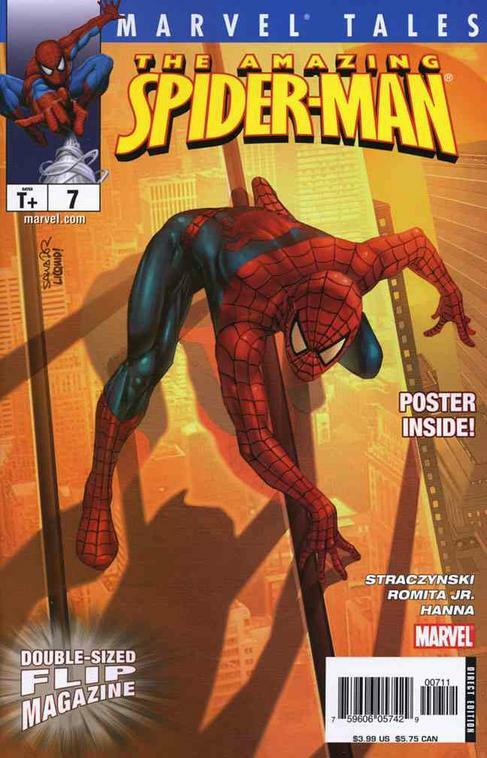 I will be the first to admit, this isn’t one of the best Spider-Man covers out there, but it does catch him in his usual “on the building” pose. The real item to note about this magazine (even though it is a comic size), is that it reprints two amazing comics. The first one is Amazing Spider-Man #36 (2nd Series). That would be the iconic 9-11 comic. The second comic it reprints is Runaways #1! The cover from #1 is also the back cover to the magazine. This would be the 1st reprint of that comic. Marvel has since then reprinted that in a Marvel Must Have comic. As of today, there is one on the bay, and one on mycomicshop. Some of these Marvel Tales have J Scott Campbell covers, so they usually get scooped up from collectors, but in my opinion, this would be the one to get. Two top quality comics in one place. Both comics that are reprinted usually go for over $30 each. Also, the legendary status of Romita Jr, Straczynski and Hanna in one place. And to top it all off, the print run for these was miniscule. All under 1,000 printed. Happy Hunting fellas! I found a copy @ Midtown.